Published on February 13, 2012 in Libya by unwatch. 20 Comments Tags: Gay Rights. 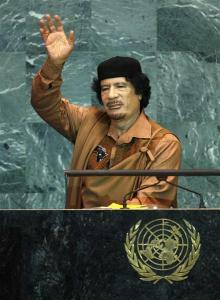 Where is Qaddafi’s Woman at the U.N.? The appeal names Jean Ziegler, a member of the UNHRC Advisory Committee, who in 1989 announced the creation of the “Moammar Qaddafi Prize for Human Rights.” While Libya’s rights record was being reviewed last year by the UNHRC, a Libyan-funded group tied to Ziegler distributed within the UN a Ziegler-edited book comparing Qaddafi to French philosopher Jean-Jacques Rousseau. 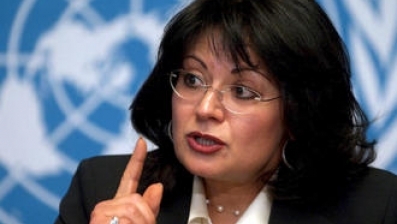 The 45 NGOs, mostly from Africa, also urged the council to fire Najat Al-Hajjaji, Qaddafi’s long-time representative to UN human rights bodies, from the council’s expert working group on mercenaries and human rights. GENEVA, March 3 – UN rights chief Navi Pillay was criticized in the plenary of the UN Human Rghts Council today for allegedly ignoring Libyan human rights violations prior to the current crisis, and for her alleged silence when the UN legitimized the Qaddafi regime through a series of appointments to key human rights and world bodies. More quotes below from the UN Human Rights Council’s report on Libya, scheduled for adoption in the current March session. See our previous post here. UN Watch urges the UN General Assembly to immediately adopt the draft resolution below, which has been circulated by diplomats in New York. 2. Decides to review the matter, as appropriate.